X Japan (エックス・ジャパン) is a Japanese metal band founded in 1982 by Deyama "Toshi" Toshimitsu and Hayashi Yoshiki. Originally named X, the group achieved its breakthrough success in 1989 with the release of their second album Blue Blood. They started out as a power/speed metal band and later gravitated towards a progressive sound, at all times retaining an emphasis on ballads. After three more albums, X Japan disbanded in 1997, but reunited in 2007. 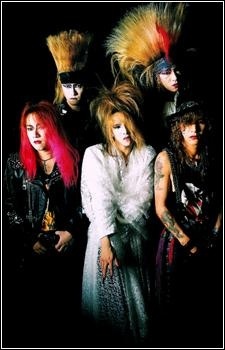 Besides being one of the first Japanese acts to achieve mainstream success while on an independent label, the group is widely credited for pioneering the visual kei movement,though most of the group's members toned down their on-stage attire in later years. They were formerly known for their excessively large hairstyles resembling fountains. As of 2007, the band has sold over twenty million records and over two million home videos. On 4 June 2007 it was announced the band would reunite with a new song released via digital download in January 2008 and live performances scheduled for March and May. "Desert rose, why do you live alone?" ... Who would say that it is a song would change my life, and who would say that I would know one of the best bands that I have had the opportunity to listen to. Jeden z niewielu zespołów, którego słucham przez 8 lat. Jest jedną z wielu moich inspiracji, żeby grać na gitarze elektrycznej. Ich muzyka w ogóle się nie zestarzała. I pisze to Polak. Szkoda tylko, że Hideto i Taiji już nie ma tutaj na ziemi, ale oni żyją gdzie indziej, też w moim sercu. Jakby można było cofnąć czas, to wziąłbym swoją gitarę i z nimi zagrał, mimo że mam kłopoty ze stawami. <3 Cieszę się, że grają obecnie. Reaktywowali się 2007 roku. W zmienionym składzie, ale mimo to też ich słucham. a band with songs full of energy and so much soul just burning i am litterally so sad that i cant timetravel back to one of their concerts and that i have to live in a smallass country.